On how human different humans happen to be (hint: equivalently human). I finally read some of the initial papers (circa 1981) describing an outbreak of opportunistic infections among previously-healthy homosexual men in the United States. The case studies are harrowing — a dispassionate litany of suffering, ending with death. And, yes, these are papers from before I was born. I should’ve read them already, or at least know enough about them that they’d have no impact. To someone like my father, for instance, who has worked with HIV patients for most of my life, the old case studies would not seem shocking — I recently read Henry Marsh’s Do No Harm, which carries a beautiful epigraph from Rene Leriche (I’m not sure who translated this from the French — if somebody knows, please tell me! ): “Every surgeon carries within himself a small cemetery, where from time to time he goes to pray — a place of bitterness and regret, where he must look for an explanation for his failures.” — my father, like most medical doctors, can surely close his eyes to summon up memories more bleak than the case studies I’ve been reading. But to me, a medical naif, the papers remind me of the horrifying violence against women section of Roberto Bolaño’s 2666. Personal tragedy and heart-wrenching suffering condensed into clinical prose. Not fun. To put these experiments in perspective, I think it’s worth considering how mustard gas works. Luckily, I took a medicinal chemistry class with Rick Silverman where we discussed the mechanism of both mustard gas and the early mustard-gas-esque chemotherapy drugs known as nitrogen mustards. It was a cool topic, so I still remember it: I’ve drawn out the mechanism (with some helpful notes!) below. And, looking back on this, there are a few things worth noting. One is, yeah, it’s perhaps obvious why I was emotionally leveled by reading those AIDS case studies — most of what I know is massively abstracted. It’s very different to hear the words “mustard gas” and envision a lines-and-letters mechanism versus seeing a image of Rollins Edwards juxtaposed with another depicting a jarful of his own skin (which appears halfway down the page for the NPR story). See the NPR article here. I’d like to think that the scientists who originally designed these experiments were picturing everything on that same level of abstraction. Not that this excuses what they did, but it’s slightly less awful to imagine that they were simply oblivious to the human harm they were causing. The second is, well, look! 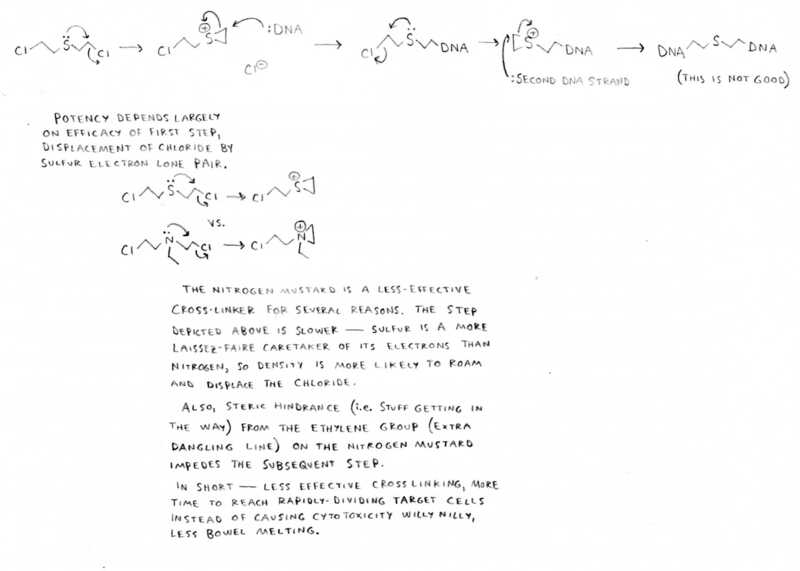 Mustard gas crosslinks DNA! How different from black or Puerto Rican or Japanese soldiers did those white scientists imagine themselves to be to think that mustard gas would show differential efficacy? And that’s why I was looking up the AIDS papers. Because I attended a symposium in 2002 where Lane Fenrich read excerpts from those original papers. His message was that the authors of those original papers implied that homosexuals are distinct on a cellular level. Depression of T-cell numbers and of proliferative responses to the degree observed in our patients has not been reported to occur in ctyomegalovirus-induced syndromes in normal persons. Should I be doing something cheeky with font to add emphasis to the words “normal persons” at the end of that sentence? Naw, I think you probably get the point. Infectious agents not yet identified may cause the acquired cellular immunodeficiency that appears to underlie [Kaposi’s sacroma] and/or [Pneumocystis cainii pneumonia] among homosexual males. Again, the message being sent is that there are cellular differences. An infectious agent targets basic human biology among homosexual males. Which is a crazy message to send. Sure, they only had a small data set — they didn’t have any evidence yet that the same infectious agent might cause immunodeficiency in heterosexuals, or in women. But, wouldn’t that be a reasonable assumption to make? You have to presume pretty extreme levels of otherness to think that would not be the case. 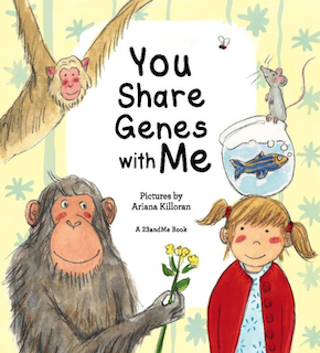 Reading these papers made me pretty happy that a friend sent us a copy of 23andMe’s board book You Share Genes with Me shortly after N was born. With corny rhymes the book celebrates how similar we are to organisms ranging from grasses, flies, fish, up to chimpanzees and our (presumed) human friends. With numbers, too — if N could speak, perhaps she could let you know that chimpanzees share ca. 96% of her DNA sequence, and another human baby ca. 99.5%. Which is a nice message to send. Human brains are so good at presuming otherness; it’s charming to have a book for her that makes clear how similar we all are, people, animals, and even plants. p.s. Maybe you’ve read reports about pharmaceuticals with race-based differential efficacy. And, yes, despite over 99% DNA sequence identity between any two human beings, there are some differences that correlate with ethnicity. Appearance, for one — many people assume they can assess ethnicity well from photographs. Lactase persistence is another, and that seems to have developed recently (as far as evolutionary timescales go). It’s not so unreasonable to imagine differences in drug metabolism between humans of differing genetic ancestries, and that can have a big impact on efficacy: two people taking the same dose of a medication might experience significantly different concentrations of the active ingredient. In the past, the FDA has had no problem generalizing clinical trials involving white people to approve drugs for everyone. That is because it believes that white bodies function like human bodies. However with BiDil, a clinical trial involving all African Americans could only serve as proof of how the drug works in blacks. On reading books in prison (which luckily I have never done). On Viet Nguyen’s The Sympathizer, the grotesque in art, and guilt.